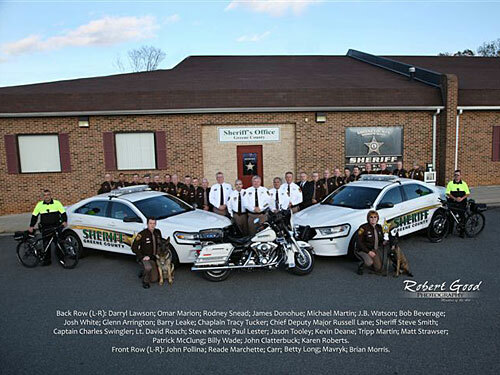 The Greene County Sheriff's Office is the primary law enforcement agency servicing roughly 18,500 people within 157 square miles, and is located just north of Charlottesville, Virginia. It is comprised of dedicated individuals sharing the vision of the Sheriff, and who perform as a team to accomplish set goals and objectives. Sheriff Steven S. Smith's Administration Division is directed by Major Charles Swingler, and consists of an administrative assistant and two clerical support staff. Both the Field Operations Division and Criminal Investigations Division, is lead by Captain David Roach. On the FOD side he oversees patrol, court security, civil process, school resource officers, K-9 and animal control functions. Field units have the primary tasks of answering calls for service, investigating minor crimes, serving civil process papers, routine and directed patrol, traffic and DUI enforcement. In addition, the department is staffed with personnel possessing specialized training in search and rescue, special weapons and tactics (SWAT), and other special operations and emergency response. This Division has five sergeants, fifteen deputies and two animal control officers. The CID section is tasked with the detailed and extensive follow-ups that are necessary with serious crimes such as homicides, sexual assaults, grand larcenies and narcotics. The CID unit is made up of one sergeant and two investigators, one of which is assigned to the Internet Crimes Against Children (ICAC) Unit. The Communications Division, lead by 911 Operations Manager Melissa McDaniel, provides critical communication and emergency dispatch to all first responders. The communication center is setup with 4 consoles and is staffed 24 hours a day, 365 days a year to serve the citizens of the community. Communications has fourteen communication officers, and three of these are training officers. Steve Keene serves as Program Manager of the newly implemented Planning and Programs Division, which conducts research, plans, develops and implements innovative approaches to complex criminal justice, public safety and emergency preparedness issues. And finally, the Victim/Witness Assistance Director is Kenlyn Snow, who assures that every possible benefit, service, and courtesy be extended to crime victims and witnesses.